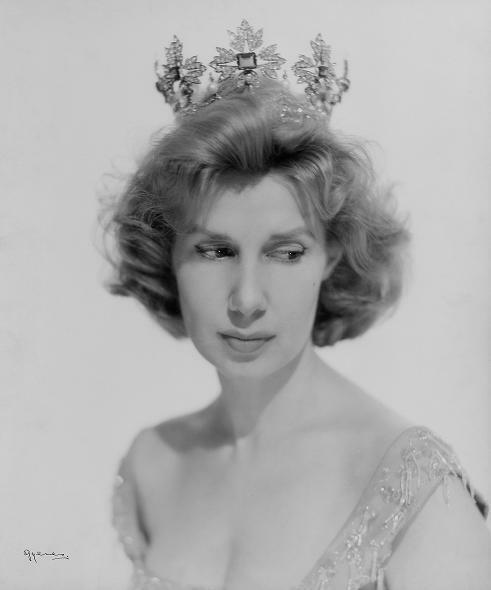 this photograph of the 18th Duchess of Alba predates the invention of the cotton gin. Following the death of the Duchess of Alba almost a year ago, we received more requests for a post on the tiara Doña Cayetana sports above than any other bit of royal gear ever. Ever. It’s a Spanish Ducal coronet. Yeah! We haven’t talked coronets in ever! Although we have never ascertained in which age–stone, iron or bronze, these daguerreotypes of doña Cayetana were taken, we all conquer it bares an uncanny resemblance to the Spanish Wedding Gift tiara, that transformer of tiaras give n to Queen Fabiola by Generalísimo Franco and his wife. There’s a good reason for that. The wedding gift tiara was originally the cornet of the Duque de Medinacelli. Check out the painting (right) of the Duchess of Medinaceli done in 1861. Yep, there’s the ducal tiara that would be Fabiola’s one day. So it all adds up. Back to the headpiece in question, your Blog Hostess has also seen the Alba Ducal Coronet called the Alba Fleuron Tiara. To be fair, it’s not really a tiara, it’s the Spanish ducal coronet. So…nyyyaahhh. [The Trash Heap has spoken. Heh.] It’s entire frame is inlaid with diamonds, though you can’t tell from most of these. The fleurons and base are also thus encrusted for maximum brilliance. The fleurons are linked by festoons to alternating, shorter spires each topped with a pearl. The first image we’ve found is of the current Duke’s great-grandmother, Maria del Rosario Falcó y Osorio, the 16th Duchess Consort of Alba. It’s not our favorite look. We’re guessing the coronet has a flexible base, compare how Maria wore it–high & tight–to her daughter-in-law, the 17th Duchess, also named Maria Rosario–how Oedipal! Both Maria Rosarios held many titles in their own right that were eventually incorporated into the laundry list upon which the House of Alba is oft commented. Maria Rosario de Silva y Guturbay, as an only child, inherited 3 duchies, 5 counties, 3 marquessate, including Híjar and San Vicente de Barco, 7 of these titles with “Spanish Grandee-ship” attached. Her mother-in-law, Maria Rosario Falcó y Osorio was the 11th Countess of Siruela, a house that dates back to the 15th Century. Her mother-in-law, known quaintly as Paca de Alba, added another dukedom, 6 marquessates, 5 counties & viscounts. The 15th Duchess Consort was also Eugenie de Montijo’s older sister, which explains how the grand Alba Wedding Tiara ended up in the family. In three generations, the House of Alba managed to marry at least 30 titles into the flock. That’s rather impressive. What does all that mean? That they have a f**kload of ducal coronets lying around. Or they indisputably have the authority to own just the one. But we digress. As far as we can count, the coronet appears to have 8 fleurons and has at least 2 sets of interchangeable stones. Either that or those emeralds photogenic traits vary from opaque to sometimes transparent like sea glass. Above is a 50s pic of Doña Cayetana, the 18th Duchess & persona that amuses us the most here. The best image of the tiara by far is facilitated thanks to color photography. We think this is still before her first facelift which as far as we know was the first facelift ever. Yeah, that thing is loaded with diamonds, huh? The tiara not her pre-op face. The Duchess pairs it smashingly with that green 1970s dress as photographed above at the Count of Quintanilla’s wedding to Teresa de Sayn-Wittgenstein-Sayn in 1973. It’s so fortunate she did not opt for that pea-green. Which look do you like best? I like the low-&-across look of the 17th Duchess, doña Cayetana’s mom. This entry was posted in court and social, diamond, emerald, spain, tiara time! and tagged ducal, spain, tiara. Bookmark the permalink. You know, you could seriously hurt someone with that tiara! it does have a lot of corners, doesn’t it?